Posted by carolhagen in iPhone, linkedin, Social Media Tools. In my attempt to help others leverage LinkedIn it dawned on me just how unfamiliar most construction business owners and their business development staff really know about LinkedIn and the apps that utilize it’s information. I have shared the “7 Lesser Known Apps to make LinkedIn Pop” and recognize there are more apps and tools to share that will improve productivity, garner deeper relationships and manage your connections. 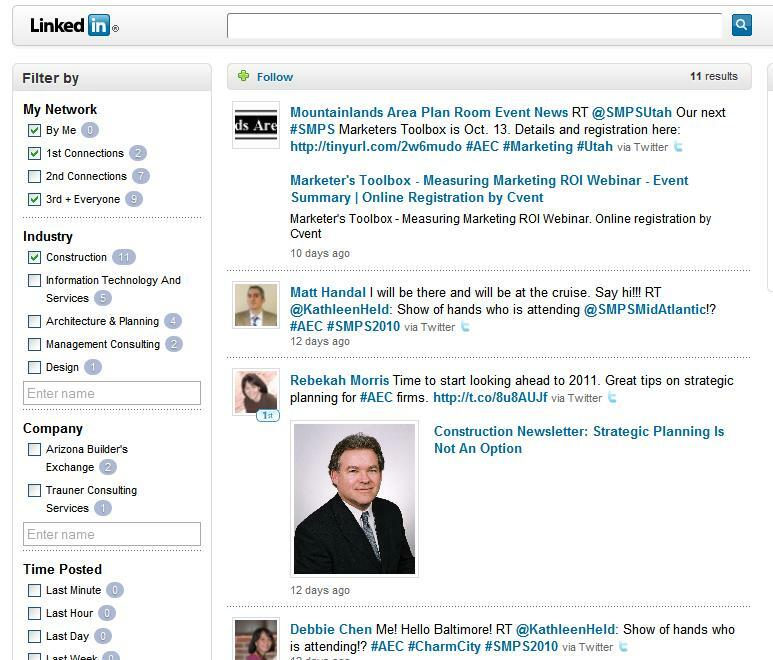 These are the Secret LinkedIn Apps to Success for Construction Business Development. Every SMPS member should be leveraging these tools and become more effective in managing their construction industry connections. Evernote Hello (Android, iPhone) – Scans Business cards, automatically connects, makes meetings memorable. Great for prequalification presentations, jobsite, and pre-construction meetings! CoBook (iPhone) Imports your contacts with Rich Profiles, organizes volumes of contacts with intelligent search by name, company or group. It also displays the local time for each contact – a handy feature! To get it to work with LinkedIn, On your iPhone, open Cobook’s Settings and simply shake your phone. 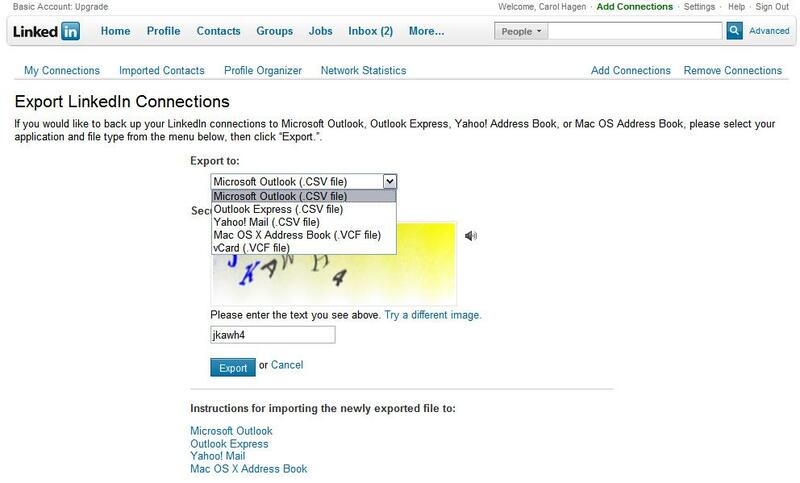 Aggregating your contacts in one place so you’re never caught without your contacts while at the jobsite. Tout Email analytics, email templates, live feed interaction with links to call, email or access your CRM (Customer Relationship Management) system for personalized follow-up. If you don’t have a CRM solution you can import your contacts by group or association. Works with Outlook, Gmail and synchronizes with your LinkedIn Connections. The ultimate in easy follow-up to all your important construction meetings and business development opportunities. Five Hundred Plus For those of you with over 500 LinkedIn connections, this personal CRM tool now has a team feature if you have team members nurturing a prospect. 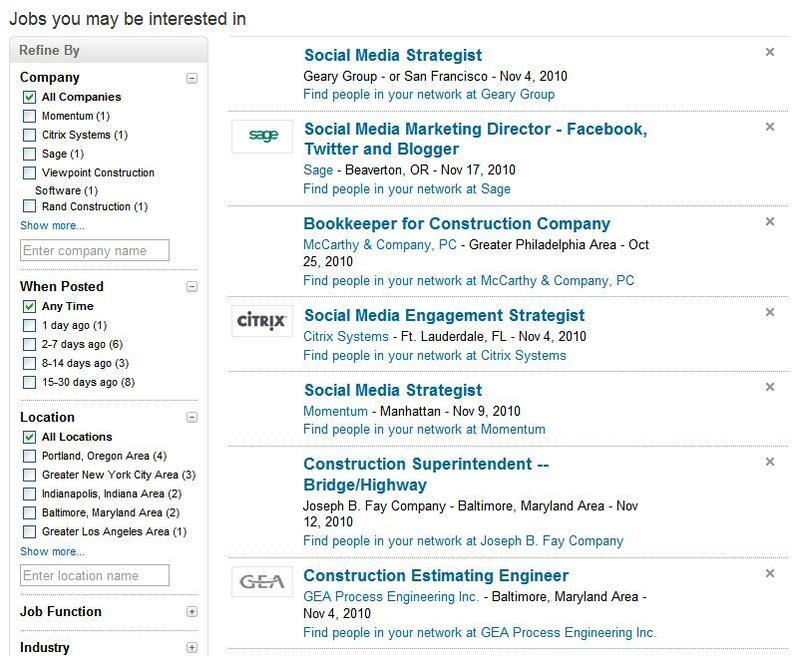 Keep you LinkedIn connections close and nurture referrals with those that influence the construction industry. ProInsights.me (Android tablets, iPad and the iPhone) This app offers a better way to visualize your connections with infographics, has an intelligent search that’s useful for finding someone when their name escapes you. Sorry no videos available on this one but there’s a quick overview preso on their website. 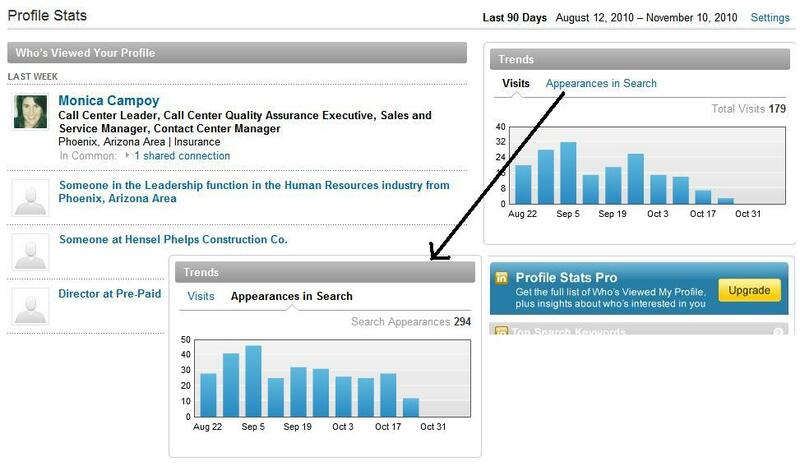 Most construction professionals are visual, so make your LinkedIn connections and relationships easier to navigate. NoteLeaf (Android, iPhone and Blackberry) This is a fantastic app that takes your Google Calendar (Which I sync my Outlook too daily) and gives me a recap of who I am meeting with 10 minutes before my meeting on my mobile device. Although not currently accessible in beta trials, add your email and get invited to their official release. 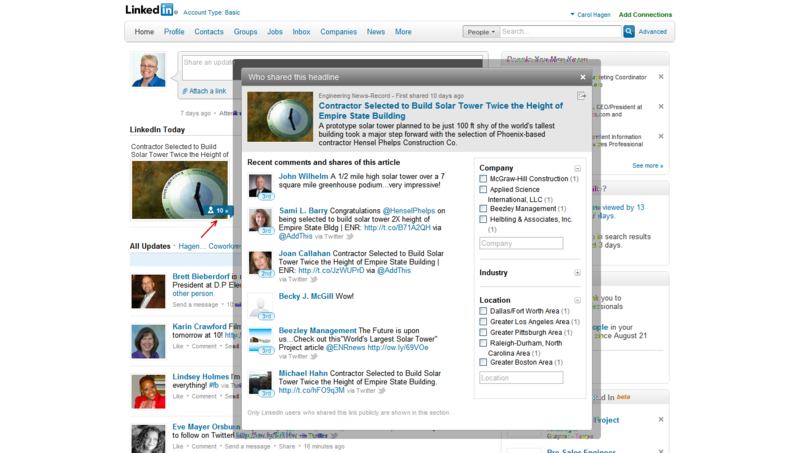 I’ve used this for over a year, keeping me informed with my construction prospects, influencers and customers. Charliehq Another suggestion to sign-up for early. CharlieHQ will give you a reminder before a meeting and help you stay current with a contacts activities. Heard about this tool via my network. Looking forward to it’s release! Posted by carolhagen in Construction Industry - Software, linkedin, Social Media Tools. LinkedIn is the king of Business to Business Social Networking but few have taken the time to learn the details of how to leverage their personal and company profiles. Even fewer have found the real secrets of using applications that can extend the value to their email, smartphone or tablet. Sure they have the LinkedIn App installed on their phone, but it’s terrible for inviting people to connect with you on LinkedIn. One day LinkedIn will add a way to customize your invitation on their mobile app but who has the time to waste in this fast paced world? These seven applications will help make LinkedIn deliver business results and fulfill your 2013 resolution of leveraging Social Media. Best of all most of these apps are free to use (some offer premium services). To Meet People When Traveling: HereOnBiz ( iOS only) is perfect for when you are looking to meetup with connections in other cities, and receive notification when connections that matter are nearby or at the same event. To Keep Track of Who You’ve Spoken To and When: ConnectedHQ is a lite Customer Relationship Management solution CRM (owned by LinkedIn) which also incorporates profiles from Twitter, Facebook and Google+ providing a universal address book, comprehensive profiles, daily agendas and events. To Showcase Your Expertise: Slideshare lets you upload your presentations and docs (owned by LinkedIn) so you can embed them on your LinkedIn Profile in the Summary, Education or Experience Sections. Learn one App a day, and in a week you’ll be ready to make LinkedIn Pop! If you are in the construction industry, I invite you to connect with me on LinkedIn to learn more about software, apps and construction specific tech topics a. Posted by carolhagen in Construction Industry - Software, Lean Construction, linkedin, thought leadership. Now there are many other talented people that serve and are dedicated to the construction industry that are authors, bloggers, business leaders, educators and innovators that often share their wisdom. Apparently LinkedIn doesn’t know the construction industry that well so I though we could get a list going of who should be considered and help Architecture, Engineering and Construction learn at a more rapid pace. Please add to this list with your thought leader recommendations in the comments. I’ll update this post weekly with all your additions. Once we have a list of 25+ compiled I’ll see if we can get them submitted to LinkedIn. This is obviously a join effort and with the help of the industry we can leverage the construction industry expertise and share best practices, critical thinking, technology and leadership that can propel the future. Again make suggestions in the comment section. We’re all missing out on tribal knowledge. Let’s pool it together. Thanks for your submissions and please share this with others. Posted by carolhagen in Construction Industry - Software, linkedin. So you’re country or city isn’t listed? Ask me in the comments – I’ll be happy to answer. I’d also like to know where you are and if you are leveraging LinkedIn for your business. Share your stories. 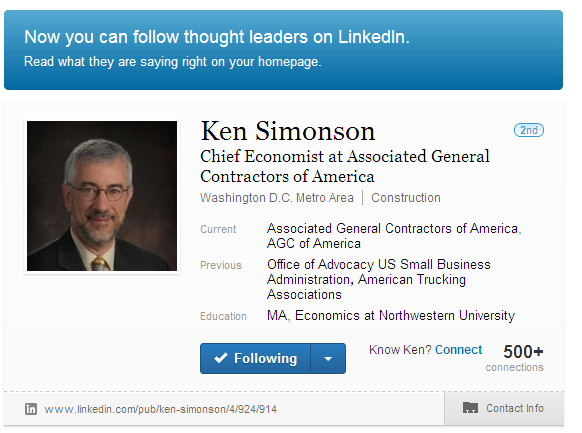 LinkedIn is being embraced by the US Construction Industry. In doing research to create the interactive map below I looked beyond just the Top 5 countries having the largest number of profiles and found many interesting details. Some countries like the Netherlands and Denmark while having small populations surprised me by the number of construction professionals on LinkedIn. Most larger population English speaking countries were well represented in the Top 10 as were a few key European and Middle Eastern countries. If you click on the map you can hover over the country to see how many construction profiles are present. Are there countries (or cities) you need the numbers on? I’m here to help, just ask in the comments section, or drop me a line on LinkedIn. profiles world wide in the construction industry as of April 18, 2012 – there are more people to connect with everyday than we can ever approach for business development opportunities. The US has over 1,000,000 LinkedIn profiles in the construction industry and over 284,000 are construction owners. The best way to reach and influence this large volume of AEC movers and shakers is using LinkedIn Groups. Keep in mind that joining a group doesn’t mean “Aha – look at all the people I can spam!” but rather “How many people can I honestly help” and “What can I share that will make a difference to each group member”. Business development also means more than marketing. We all need an education, to network with peers and with prospective clients. Be careful in joining too many groups or weighting them too heavily to your peers (I see this problem often), rather that to focus on your targeted prospects. Remember you are looking for business opportunities. Once you have a discussion going you can build trust and eventually set a face to face meeting. Yes, that’s still how it’s done in construction. So which groups seem to be most beneficial for construction business development professionals? Most of the national LinkedIn groups have 1000’s of members but a few are specialty niches. Some are construction or business development focused while others are not. The local groups are often more intimate with a few hundred members. Pick and choose wisely. Take the time to look at the membership statistics of each group. Sometimes more members isn’t better as the seniority and regional info is a tell tale measurement. Remember that balance is important and plan to participate after listening to the discussions that evoke the most responses. Finding what resonates in the group will keep you busy and make you more successful. If you found this construction business development article helpful, I’d like to hear from you. Either connect with me on LinkedIn (say biz dev in the invitation and use the “we’ve done business together”) or leave a comment below. I look forward to hearing from you. 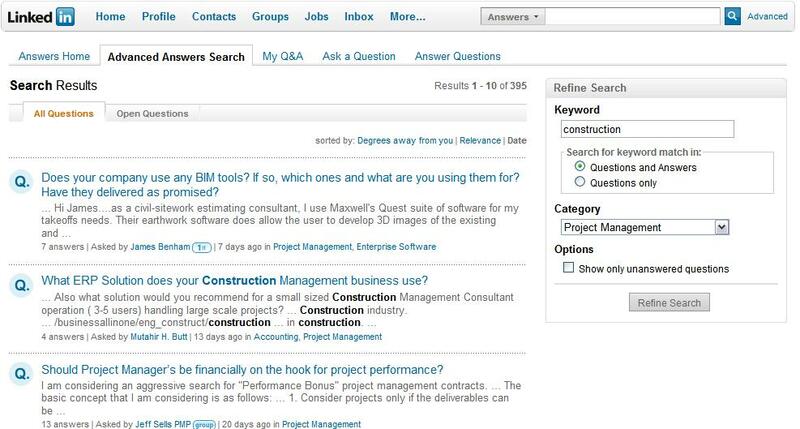 Posted by carolhagen in construction accounting software, Construction Industry - Software, linkedin, payroll. The Arizona Construction Salary Survey provides you with the employee compensation benchmarks for budgeting and data for best practices during your salary negotiations. 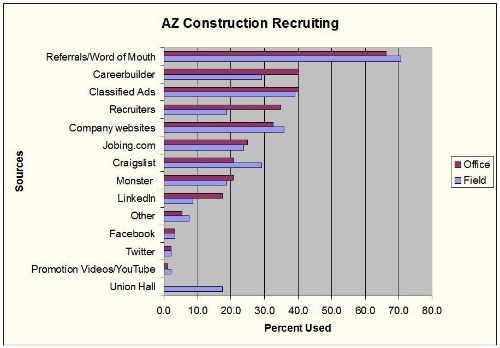 The Construction Financial Management Association, Valley of the Sun Chapter is in the process of compiling the results of the December 2011 Arizona Construction Salary Survey. In this sneak peek of the talent employment development section of the survey, the social media recruiting sources while growing, are underutilized, by our survey participants. and you clearly see the disparity. LinkedIn is the business executives and professional recruitment golden roledex. If your Human Resources Department didn’t realize it, your professional recruiting firm does. 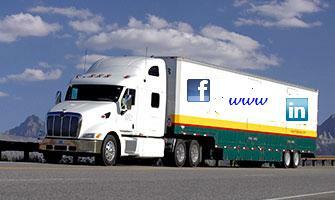 As Jobvite has reported, “2/3 of Companies have Hired Successfully using Social Networks”. This is why I blog and teach contractors about LinkedIn, social tools and technology, because there’s a bottom line business value, and it’s not just in recruiting employees. For those that participated in the Arizona Construction Salary Survey, the full results will be sent to you via email in January 2012. The 2011 Survey is available for purchase for $100 (2009 Survey is available for $50). Request your copy via Email. If you are looking for ways to better Leverage LinkedIn or have successfully recruited field, office or management positions in the construction industry on social networks, please let us know in the comments. Lastly, please share this with your business connections so they can benefit too. Posted by carolhagen in Facebook, linkedin, Social Media Tools, Twitter. Twitter (My followers) – Thank you for following, mentioning and retweeting my content. If it weren’t for you no one would hear me and Twitter would be a big time waster – funny thing is that the majority of uniformed business people think this way. Let’s keep the Twitter value a secret as it is a competitive advantage, especially for the AEC sector. Twitter (I’m following) – Thank you for unselfishly sharing your business acumen, thought leadership, and technology wisdom with me. For taking the time to answer my questions and developing lasting friendships with many I may never meet in person, I am forever grateful. I look for ways to reciprocate with you and hope to continue growing personally and professionally through your blog posts, event tweets and shared content. Linkedin – A special thanks goes to each personal connection who has written a recommendation for me. Your “trust” gift to my profile has attracted speaking engagements and business opportunities that have contributed directly to my professional success. To my connections – your likes and shares have helped countless others with their social media, technology and business education. Thank you for sharing announcements, blog posts and networking opportunities with the construction industry. We’re all working for the same outcome – growing infrastructure opportunities, a healthy housing market and a prosperous year ahead. Facebook friends – It’s wonderful to connect with old friends and new, sharing breathtaking photos and humorous video moments. For those also sharing business content, thanks for caring about my success. A special thanks goes to Mari Smith and ALLFacebook who continue to make facebook changes less intimidating and offers ideas for your business to leverage Facebook. For the contractors and employees who have chosen me as a Facebook friend or liked my company page, please inform your employer that Talent attraction and community outreach work well here and to the residential contractors it’s a must for reaching business opportunities! WordPress – Appreciation goes out to all my blog subscribers, and those that have commented on a blog post. Each of these small actions (like, share, +1) has helped to drive traffic to my website often leads to business synergies. Google+ – You’re new to the party. While few people have asked to be in my circles, many of those that have are my closest influencers, news sources and advisers. Thank you for being here – Your deserve a +1 everyday. Thank you Google for making a better social network that makes content curation, communication and collaboration easy. To my entire Business Network (those I email, see at association meetings and call on from time to time): You know the secret to networking is just genuinely caring about the success of others and building trusting relationships. May you enjoy the Thanksgiving holiday with friends and family and come back with greater appreciation for every connection you make each day. To my family that I love dearly: I know I see you infrequently and wish that instead of video conferencing and phone call a Star Trek Transporter were available so I could be there more often, share more meals, hug, laugh and cry together. May your turkey be plump, your pies be sweet and your afternoon nap be restful. Posted by carolhagen in linkedin. Students at the Del E Webb School of Construction are all thinking of their future. 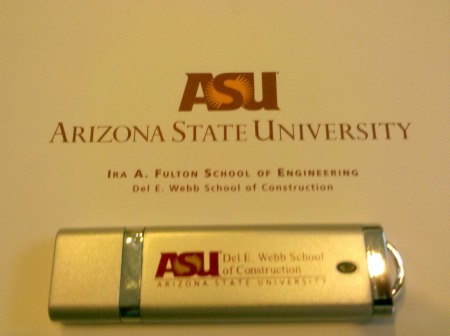 Earlier this week they all had a unique opportunity to learn how to leverage LinkedIn on the Arizona State University campus. Sixteen freshman through graduate students filled the workshop wanting to know how to attract employers to their profile, showcase their activities, and for 15, ultimately launch their project management career in construction. Having volunteered to lead this workshop, students learned the importance of a LinkedIn headline, joining Linkedin groups, networking, volunteering and gaining experience at every turn – all while documenting their activities using their smartphones – capturing pictures, video and notes to showcase what students are doing outside the classroom. Each student added new elements to their profiles and contemplated what other LinkedIn applications (Slideshare, Box.net, Google Docs, etc) and social media they might want to use to enhance their findability. If you are looking for a speaker or in need of an educational workshop to help leverage LinkedIn, please contact me, Carol Hagen. I am available in person or via webinar for your business, group or association. 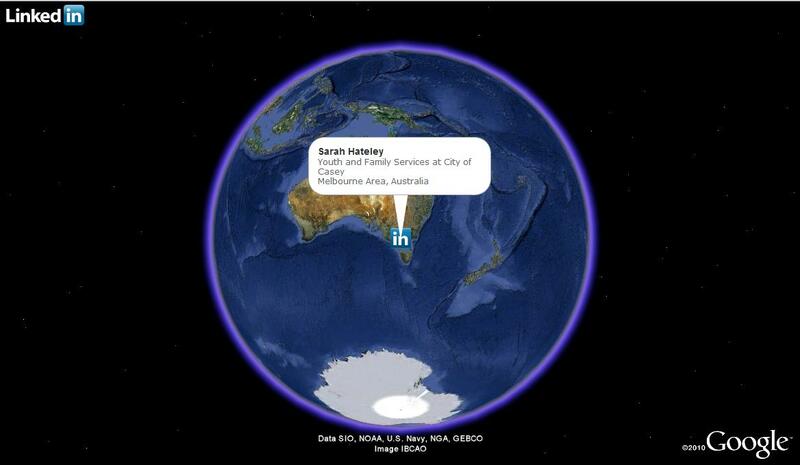 Construction companies and the AEC industry struggle to leverage social media. They don’t understand the value that LinkedIn brings as they just see more emails notices they don’t want from overzealous salesmen. The business value is hidden in learning the obvious but overlooked features and functions. Let’s look closely at LinkedIn Today. LinkedIn Today has a story trending about the Hensel Phelps Construction solar project and I couldn’t help but peek to see who was sharing this story. By clicking on the number in the lower right, a popup displays (shown above) of my connections up to the 3rd level sharing the story with their network. Why is this important you ask? What if this story was about your firm? If the social media maven at Hensel Phelps is paying attention there is an opportunity here that doesn’t occur when someone shares privately via email. An opportunity to make LinkedIn connections, show gratitude and strike up conversations. It’s the advantage that social media marketers have been shouting about but that your construction, engineering or architectural firm is still trying to figure out. If it catches someone’s interest and you know about it, don’t miss out on these social openings. You may find your next client! If you want to learn more about what you don’t know about LinkedIn or other social tools, I’m available for consulting, speaking engagements and strategy building. Posted by carolhagen in communication, linkedin, Twitter, website tips. Contractors and the construction industry as a whole love celebrations. For Architects, Contractors and Engineers a cupcake reminds us of our childhood, the birthday parties you attended and the Lincoln Logs, Erector Sets, Legos and Tonka Trucks you received. For the young women of today it might be their Architech Barbie. Every time you win a bid, finish a project, have designs accepted or get plans approved you relive these moments. Whether you’re a tradesman, project manager or CEO there’s a sense of pride and accomplishment in every task performed. It’s the same feeling around the world. So why aren’t you celebrating construction milestones on social networks and your website making them social cupcakes? Too many construction professionals are focusing on the economic woes. Stop. You know that happiness and success attract. After attending a joint networking event for the Arizona Builders Alliance(ABA), MCAA and SMPS at Audio Video Resources yesterday it was noticeable who the happy people were and just how many others were congregating around them. Lorraine at Caliente Construction was celebrating making it onto 4 short lists this week and having 2 bids awarded. Way to go! John Ulibarri had a discussion with Mark Minter on the value the ABA brings to the construction industry. Talking points with positive messages and the people around them were listening. Even my discussion with Dennis Tsonis of Lovitt and Touche had others watching us exchange contact info using the Bump app on our smartphones. That gesture of bumping is like a high five and feels like a celebration. All this translates easily onto the internet. Just this morning at a Greater Phoenix Chamber of Commerce East Valley networking breakfast we had Tim Troy of TNT Shredding celebrating the arrival of his second truck – Tim tells me he’s getting it wrapped and will be posting pictures on Facebook soon. If you need paper shredded (I’ve been to many construction offices and know you need to make some room), give him a call. 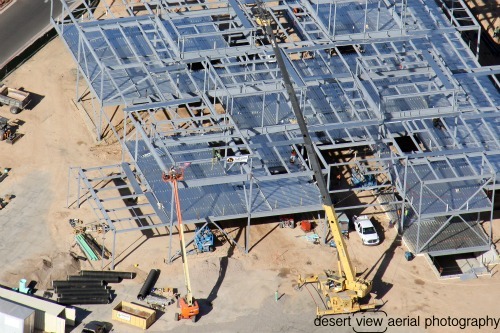 Desert View Aerial Photography captures construction celebrations daily. Here’s a top off shot for Haydon Building Corp with the American Flag and evergreen cheering on the last steel beam put in place. Many social strategy sessions end up in discussions of what to blog, tweet or share on Facebook or LinkedIn about. The content should not always be about you but on people and business you know…things happening in your community that make a difference to your clients, suppliers and employees. If they elicit emotions and fond memories all the better. That’s why Cupcakes are in the title of this post! Tell us about what you’re celebrating in the AEC industry and let’s get everyone in a great mood. Every contruction related celebration comment will be approved. Click on the comment button at the top of this post and/or share this with your friends. 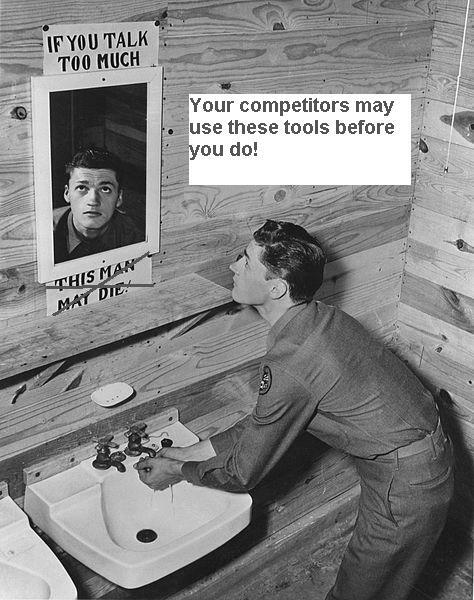 Posted by carolhagen in Construction Industry - Software, iPhone, linkedin, Social Media Tools, Twitter. The Construction Financial Management Association (CFMA) held their 2011 Annual Conference earlier this week and I must say those attending came out ahead. It’s not just the CPE credits and the speakers, but the networking that goes on that makes this such a success. Here are a few takeaways from the sessions, happenings and social events. The Chapter Summit was great and packed tightly with discussions, feedback and education. Top challenges for chapters are how to get more butts in seats, increase participation, new member attraction and finding speakers with good topics. I’d be happy to offer my presentation to chapters across the country adding a spin into business development if you need a speaker. Sharing is a big thing in social networking so here’s access to my Leveraging LinkedIn and Social Media for CFMA chapters. I invite everyone to ask questions and/or connect with me on LinkedIn if you need a leg up on how to. 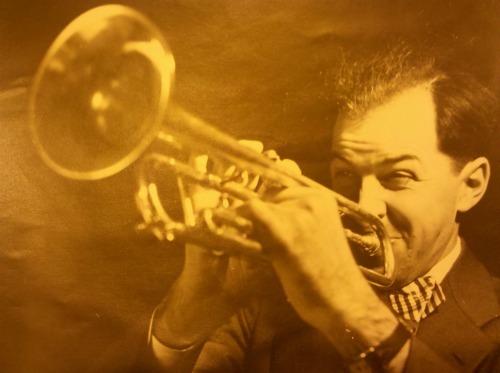 The keynote “connections” address with Marc Scharenbroich was a thunderous success in his approach to being authentic, a good listener and appreciative. His closing Boomba Hey CFMA is on YouTube or you can view it here. I’d recommend reading his book, Nice Bike to reinforce his message and his thank you extends the benefits … proceeds help military families. For those wanting to know if there was a buzz during the conference may want to review the Twitter stream of #CFMA2011 as there were a few people chatting other than exhibitors. You do not need a Twitter account to view the activity. Just go to http://search.twitter.com/search?q=%23cfma2011. As a techie, I also thoroughly enjoyed the presentation on Smartphones and immediately implemented a mobile app for my own business…it takes up to 14 days to be added to the Android Market so I’ll update this post once it’s live. If it is well received an iPhone version will be out before the end of June. I’ll keep you posted …thank you Jim Spellos for sharing Appsbar.com as a free solution! Jim also shared info on augmented reality using the layars app and for those firms or individuals that need to read signs in Spanish you should checkout the iPhone app “Word Lens” from Questvisual.com …it will blow your mind! I made new friends and connected with controllers, CPAs, and exhibitors from across the country. We danced, sang, shared stories, broke bread and had deep discussions. Special thanks go to Sue Marion and Amy Hanagan for making my stay fun, Diedre Aldous for our Main Street Days activities, Dina O’Rourke for keeping the CFMA engine running, John Corocoran for involving me in Chapter Summit and the exhibitors for sponsoring keynotes, meals, entertainments, etc …as catching up with friends but once a year is made sweeter by your generosity. To everyone I met “Nice Bike”. I’ve left a few holes for those in attendance to share their experiences, education and networking stories. Feel free to share these construction education gems and also share your own by adding comments and sharing this with others. Posted by carolhagen in iPhone, linkedin. To all my avid readers who come here for social media topics, I have decided to separate the construction technology topics and the pure social media tips by starting a new blog. Social + Websites will discuss social media tips, website design and how to engage your prospects and clients using social media in social networks and on your website. You will still get great content every week on technology issues specific to the construction industry on this blog but the social media topics will mostly appear in Social + Websites. Hope you take the time to check it out and please share this with all your friends, connections and followers. Mobile Website Surfing: Will iPhone, Android or iPad Fill Your Pipeline? Now I originally clicked on the more option and it told me there weren’t any others, but after returning to my homepage I noticed there were 3 new suggestions. I again clicked more with the same results, returning to my LinkedIn Homepage and the 3 suggestion results were 2 new ones and one repeat, but the interesting thing is what happened on clicking more this time. Low and behold they had many suggestions for me: I know this will help the job seekers out there and hope that you share this info with all you unemployed and underemployed connections. I wonder if this is a bug or intentional as LinkedIn is offering a LinkedIn Job Seeker Premium account to me? 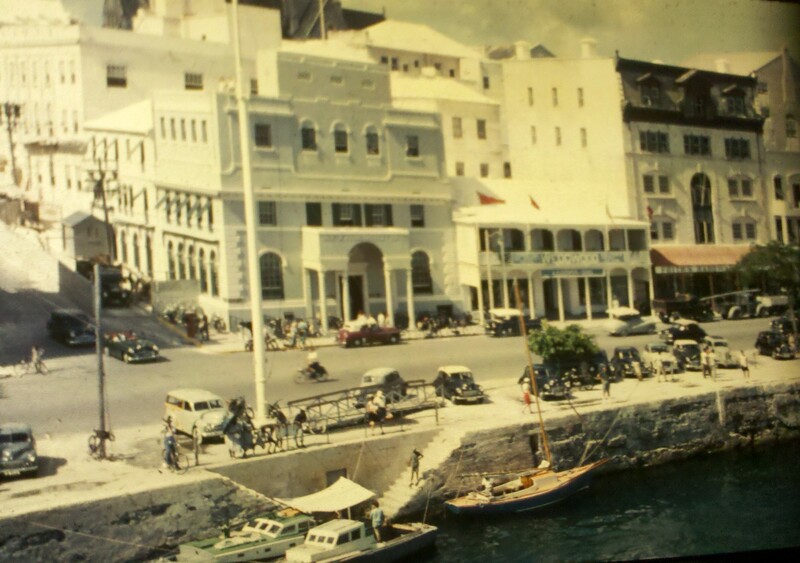 If you liked this blog post I suggest you also follow me on Twitter by clicking here. Job seekers are successfully leveraging social media, especially LinkedIn. But for many, this still seems a foreign language. Since I recently volunteered for Southwest Job Network at an event they held at Mesa Community College, it seemed appropriate to share some ideas with you. After all, social media is for sharing, caring and connecting. Take the time to evaluate the trends and examine who views your profile. You may find that you are not attracting your target audience…so rethink your keywords and re-optimize accordingly. Also in LinkedIn, research the applications directory (found under the more tab in LinkedIn) as there are many tools that can be used for enhancing your profile. If you are a good writer, consider starting to blog about the 10-20 things that makes a [enter your career or ideal job title] great. If you’re a photographer the Creative Portfolio Display can help showcase your work. Use LinkedIn Groups to connect to your peers, share an article you’ve found educational with the group, join in the discussions and start to engage your professional peers. You never know who knows someone that can help you. If you are interested in particular companies you’d like to work for, LinkedIn offers the “Follow” option. By following a company you can get updates on new hires, promotions, employees and job postings. When you see the employees, LinkedIn shows you if you have any direct connections by putting a little blue 1st box next to their name. If you see 2nd or 3rd then one of your connections knows someone there and might be willing to introduce you. FYI-companies can see you are following them. If that bothers you, then just check to see if they have any job postings under the careers tab of the company profile. Let’s help job candidates, especially Veterans and those in the construction industry, improve their LinkedIn profiles and give tips on how to use social media to attract opportunities. Please share this with the people you know to help them find a job. Also add your tips in the comments and let me know if this has helped you. Posted by carolhagen in Construction Industry - Software, linkedin, twitter. Twitter is a great tool if you know what you’re doing. Once I learned the basics, read a few books and then realized, like other “free” social networking sites that …things change rapidly in Twitter. I started bookmarking all the Twitter tweets I found valuable in Delicious, as these articles substantially enhanced my knowledge. Twitter can be used stand alone or with numerous Tools to help you listen to your favorite topics, get to know your contacts better, and share the content you or others have created. My favorite use is leveraging it’s integration with LinkedIn. Today I thought I’d share these bookmarked resources with you as an RSS Feed (so as I add more they’ll automatically add to the list or you can subscribe to my feed). Make sure you thank all the content providers as we all should keep learning. Almost forgot to ask. If you have suggestions for me to read, please add them in the comments (so everyone benefits). Thanks. Posted by carolhagen in linkedin, Software plug-in. 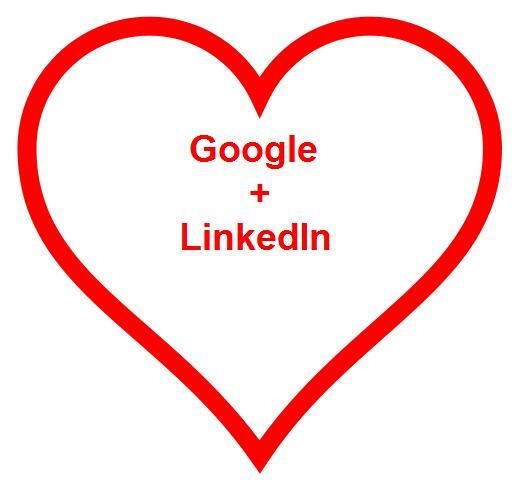 Google loves LinkedIn and I’ve been including this fact in many powerpoint presentations and national speaking engagements for over a year now. There’s more to this love than how Google searches LinkedIn profiles. We can now see the extent of the relationship with today’s LinkedIn blog post announcing LinkedIn Labs (sounds and looks like Google Labs) and the great new projects contained within Labs to prove my point. I’ve used filtering on construction as examples throughout to keep my focus on the construction industry. Next, I had to try out LinkedIn Signals. 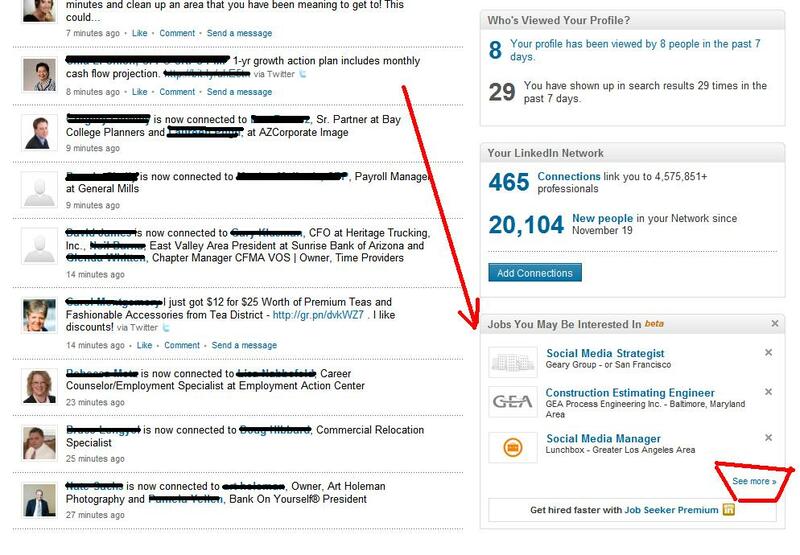 The LinkedIn Blog post today offered the 1st 500 people to request a sneak peek access. I added it after 2pm today. Signals makes LinkedIn status updates from connections look similar to Facebook as seen here: I have to believe that LinkedIn is answering Facebook’s copycat of groups with a more business-like copy of the Facebook Wall. Perhaps this isn’t so much Google’s love for LinkedIn, but their answer to a possible adversary. Finally to prove my point about LinkedIn and Google is the introduction of INstant, a Google-like search for the LinkedIn User that displays the connections you have based upon your search criteria. 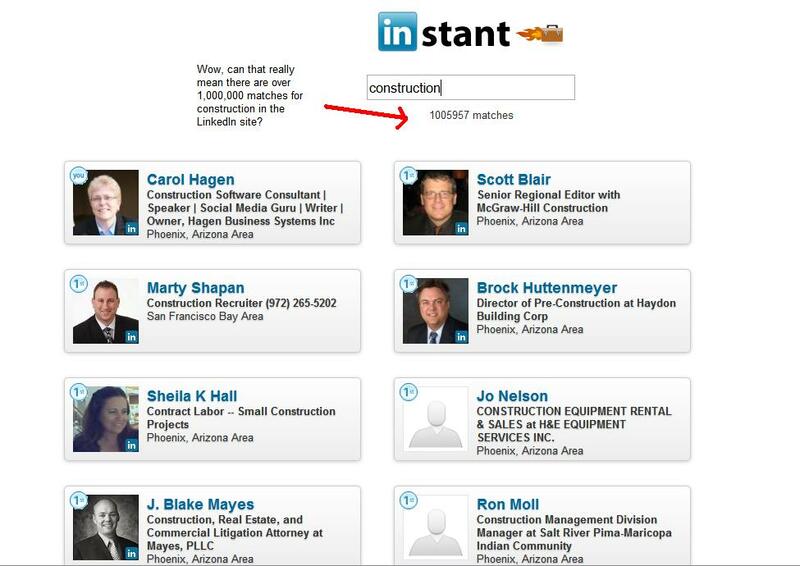 I can’t believe that there are over a million instances of construction but this screen shot verifies that very fact! Then there’s ChromeIn, which I didn’t try out, but then I haven’t used Chrome yet. Being able to see your LinkedIn connections’ status updates in your Chrome Browser must be a good thing for Google. My take is that with all the Google love for LinkedIn, Facebook is none too happy with their Business to Business audience performance. What’s your opinion?